A bold lip, red nails, a flick of cat eye liner: fashions come and go, but these looks transcend trends. No wonder Dior drew inspiration from them for its first ever pre-fall 2014 beauty collection, appropriately titled "Timeless Colour Icons." These classic shades and limited editions are available exclusively at Holt Renfrew starting July 2014, and let me tell you: it may still be summer, but you're going to want to wear them year round! Cult fave, wear-wet-or-dry Diorshow Fusion Mono Eyeshadow ($32) is available in 'Trompe l'Oeil' (metallic silver) and 'Rêveuse' (midnight blue with lighter blue sparkle). Meanwhile, how stunning is that 3 Couleurs Smoky easy-to-wear smoky eye palette ($50) in 'Smoky Gold'? The 3 Couleurs compact's sliding design makes it easy to pop open the palette one-handed—ideal for a smoky eye on the go. Detailed instructions and diagrams also help. This is the tip of the Diorshow Art Pen ($32) in 'Blue Croisière', a.k.a. a marvel of engineering and eyeliner precision. Draw thin lines with the tip or lay the pen flat for a thicker line. The indigo liner dries to a shiny finish, and complements the Fusion Mono shades nicely while playing up the 3 Couleurs Smoky's gold tones. 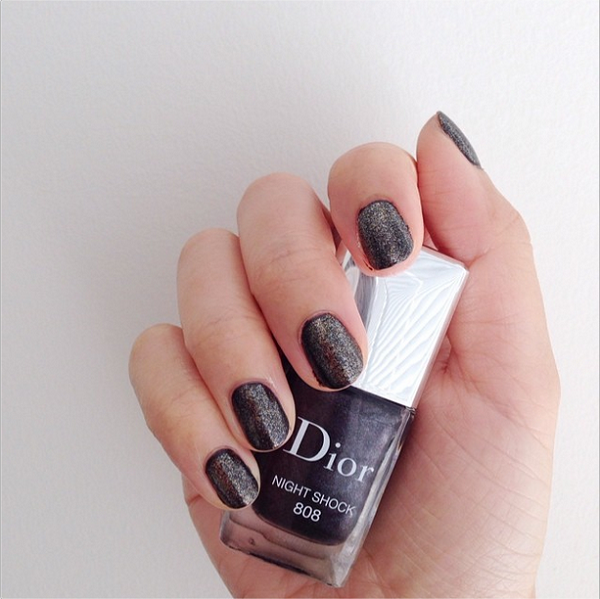 Any nail art lover's heart would race at the sight of the Dior Nail Artistry Box ($60). The kit comprises a mini Dior Vernis Chrome, a full-size gel top coat (still the best top coat I've ever used), a sheet of Swarovski crystals, 2 sheets of Dior star stencils, and a pairs of branded tweezers. And yes, a tutorial is included! It's hard to pick a favourite among the Dior Vernis Haute Couleur Gel Effect nail lacquers ($26)—they're all timeless and highly desirable in their own right. From left to right: 'Tout Paris' (a classic, creamy red that achieves full coverage in one coat), 'Night Shock' (a shimmery black), and 'Reflects' (a sheer sparkly gold that looks very pretty when used as a top coat). And if you need a reminder of why this nail polish is a winner, from the super-shiny formula to the user-friendly brush, read this review from April. Also in the collection: Rouge Dior lipstick ($36) and Fluid Stick in 'Tout Paris' (classic red to match the nail lacquer) and 'La Vie' (a cool fuchsia); and an exclusive shade of Diorblush ($43).